Nanowire gurus at the National Institute of Standards and Technology (NIST) have made ultraviolet light-emitting diodes (LEDs) that, thanks to a special type of shell, produce five times higher light intensity than do comparable LEDs based on a simpler shell design. The new, brighter LEDs are an outcome of NIST’s expertise in making high-quality gallium nitride (GaN) nanowires. Lately, researchers have been experimenting with nanowire cores made of silicon-doped GaN, which has extra electrons, surrounded by shells made of magnesium-doped GaN, which has a surplus of “holes” for missing electrons. When an electron and a hole combine, energy is released as light, a process known as electroluminescence. The NIST group previously demonstrated GaN LEDs that produced light attributed to electrons injected into the shell layer to recombine with holes. The new LEDs have a tiny bit of aluminum added to the shell layer, which reduces losses from electron overflow and light reabsorption. As described in the journal Nanotechnology, the brighter LEDs are fabricated from nanowires with a so-called “p-i-n” structure, a tri-layer design that injects electrons and holes into the nanowire. The addition of aluminum to the shell helps confine electrons to the nanowire core, boosting the electroluminescence fivefold. “The role of the aluminum is to introduce an asymmetry in the electrical current that prevents electrons from flowing into the shell layer, which would reduce efficiency, and instead confines electrons and holes to the nanowire core,” first author Matt Brubaker said. The nanowire test structures were about 440 nanometers (nm) long with a shell thickness of about 40 nm. The final LEDs, including the shells, were almost 10 times larger. Researchers found that the amount of aluminum incorporated into fabricated structures depends on nanowire diameter. Group leader Kris Bertness said at least two companies are developing micro-LEDs based on nanowires, and NIST has a Cooperative Research and Development Agreement with one of them to develop dopant and structural characterization methods. The researchers have had preliminary discussions with scanning-probe companies about using NIST LEDs in their probe tips, and NIST plans to demonstrate prototype LED tools soon. The NIST team holds U.S. Patent 8,484,756 on an instrument that combines microwave scanning probe microscopy with an LED for nondestructive, contactless testing of material quality for important semiconductor nanostructures such as transistor channels and individual grains in solar cells. The probe could also be used for biological research on protein unfolding and cell structure. To promote U.S. innovation and industrial competitiveness by advancing measurement science, standards, and technology in ways that enhance economic security and improve our quality of life. NIST will be the world’s leader in creating critical measurement solutions and promoting equitable standards. Our efforts stimulate innovation, foster industrial competitiveness, and improve the quality of life. NIST is an organization with strong values, reflected both in our history and our current work. NIST leadership and staff will uphold these values to ensure a high performing environment that is safe and respectful of all. Perseverance: We take the long view, planning the future with scientific knowledge and imagination to ensure continued impact and relevance for our stakeholders. Integrity: We are ethical, honest, independent, and provide an objective perspective. Inclusivity: We work collaboratively to harness the diversity of people and ideas, both inside and outside of NIST, to attain the best solutions to multidisciplinary challenges. Excellence: We apply rigor and critical thinking to achieve world-class results and continuous improvement in everything we do. Experimental atomic clocks at the National Institute of Standards and Technology (NIST) have achieved three new performance records, now ticking precisely enough to not only improve timekeeping and navigation, but also detect faint signals from gravity, the early universe and perhaps even dark matter. The clocks each trap a thousand ytterbium atoms in optical lattices, grids made of laser beams. The atoms tick by vibrating or switching between two energy levels. By comparing two independent clocks, NIST physicists achieved record performance in three important measures: systematic uncertainty, stability and reproducibility. NIST physicist Andrew Ludlow and colleagues achieved new atomic clock performance records in a comparison of two ytterbium optical lattice clocks. Laser systems used in both clocks are visible in the foreground, and the main apparatus for one of the clocks is located behind Ludlow. Systematic uncertainty: How well the clock represents the natural vibrations, or frequency, of the atoms. NIST researchers found that each clock ticked at a rate matching the natural frequency to within a possible error of just 1.4 parts in 1018—about one billionth of a billionth. Stability: How much the clock’s frequency changes over a specified time interval, measured to a level of 3.2 parts in 1019 (or 0.00000000000000000032) over a day. Reproducibility: How closely the two clocks tick at the same frequency, shown by 10 comparisons of the clock pair, yielding a frequency difference below the 10-18 level (again, less than one billionth of a billionth). Einstein’s theory of relativity predicts that an atomic clock’s ticking, that is, the frequency of the atoms’ vibrations, is reduced—shifted toward the red end of the electromagnetic spectrum—when observed in stronger gravity. That is, time passes more slowly at lower elevations. While these so-called redshifts degrade a clock’s timekeeping, this same sensitivity can be turned on its head to exquisitely measure gravity. Super-sensitive clocks can map the gravitational distortion of space-time more precisely than ever. Applications include relativistic geodesy, which measures the Earth’s gravitational shape, and detecting signals from the early universe such as gravitational waves and perhaps even as-yet-unexplained dark matter. NIST’s ytterbium clocks now exceed the conventional capability to measure the geoid, or the shape of the Earth based on tidal gauge surveys of sea level. Comparisons of such clocks located far apart such as on different continents could resolve geodetic measurements to within 1 centimeter, better than the current state of the art of several centimeters. In the past decade of new clock performance records announced by NIST and other labs around the world, this latest paper showcases reproducibility at a high level, the researchers say. Furthermore, the comparison of two clocks is the traditional method of evaluating performance. Among the improvements in NIST’s latest ytterbium clocks was the inclusion of thermal and electric shielding, which surround the atoms to protect them from stray electric fields and enable researchers to better characterize and correct for frequency shifts caused by heat radiation. The ytterbium atom is among potential candidates for the future redefinition of the second—the international unit of time—in terms of optical frequencies. NIST’s new clock records meet one of the international redefinition roadmap’s requirements, a 100-fold improvement in validated accuracy over the best clocks based on the current standard, the cesium atom, which vibrates at lower microwave frequencies. NIST is building a portable ytterbium lattice clock with state-of-the-art performance that could be transported to other labs around the world for clock comparisons and to other locations to explore relativistic geodesy techniques. The work is supported by NIST, the National Aeronautics and Space Administration and the Defense Advanced Research Projects Agency. Electron micrograph showing gallium arsenide nanoparticles of varying shapes and sizes. Such heterogeneity can increase costs and limit profits when making nanoparticles into products. A new NIST study recommends that researchers, manufacturers and administrators work together to solve this, and other common problems, in nanoparticle manufacturing. 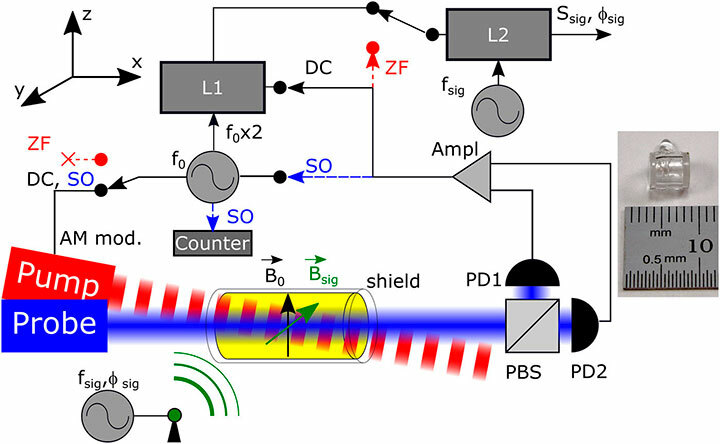 Future communications networks that are less vulnerable to hacking could be closer to reality with an invention that measures the properties of single-photon sources with high accuracy. Built by scientists at the National Institute of Standards and Technology (NIST), the device could help bring about “quantum communications” networks, which would use individual particles of light to send bits of information. Because each bit of information can be embedded in the quantum properties of a single photon, the laws of quantum mechanics make it difficult, if not impossible, for an enemy to intercept the message undetected. Both the telecommunications and computer industries would like such networks to keep information secure. The NIST method may help overcome one of the technical barriers standing in their way by measuring photons’ spectral properties—essentially their color—10,000 times better than conventional spectrometers. Individual photons have a limitation: They cannot travel through fiber-optic cables for more than about 100 kilometers (about 60 miles) without likely being absorbed. A quantum network able to handle worldwide communications would need periodic way stations that could catch photons and retransmit their information without loss. The NIST team’s invention could help such a “quantum repeater” interact effectively with photons. Key to the operation of the quantum repeater would be a memory component that uses an ensemble of atoms to store the photon’s information briefly and retransmit it at the right moment. Its operation would involve an atom’s energy structure: As an atom catches the photon, the atom’s energy level rises to a higher state. At the desired moment, the atom returns to its original state and emits the energy as another photon. Not just any photon can readily interact with this atom, though. It needs to be exactly the right color, or wavelength, to be absorbed by the atom. To make usable repeaters, engineers need to measure photons’ wavelengths far more precisely than conventional spectrometers can. The NIST team goes past convention with a technique called electromagnetically induced transparency (EIT), which starts out by using atoms’ ability to block light of a specific wavelength. Astronomers can tell what gases form the atmosphere of a far-off world because light passing through it makes the gas molecules vibrate at frequencies that block out light of particular colors, creating telltale dark lines in the light’s spectrum. EIT essentially creates a single dark line by beaming a laser at atoms whose vibrations block much of its light. A second laser, tuned to nearly the same wavelength as the first, is directed at the same atom and the interference between these two nearly identical beams alters the darkness. Instead of a simple dark line, it creates a line with a narrow transparent hole through which photons only of an extremely specific wavelength can pass. By making fine adjustments to the second laser’s wavelength, the team found it could move the hole back and forth across the dark line’s width, giving them a way to make highly precise measurements of a passing photon’s wavelength. To give a sense of how precise their spectrometer is, the team gave the example of a common laser pointer that shines in a single narrow color range, creating a pure-colored point on a screen. The typical spectrum width of a laser pointer is right around 1 terahertz (THz). The NIST invention can measure the color of a single-photon-level signal that has a spectrum 10 million times narrower than the laser pointer, resulting in a performance 10,000 times better than typical conventional spectrometers. Researchers at the U.S. National Institute of Standards (NIST) are working on ways to overcome a vexing problem of a wireless world: how to get usable signals in crowded built environments, underground and even underwater (Rev. Sci. Instr., doi: 10.1063/1.5003821). At the heart of the team’s approach is an optically pumped magnetometer (OPM)—a highly sensitive, room-temperature quantum detector that can do double duty as a kind of magnetic-radio receiver. In the NIST setup, the OPM is used to pull in modulated signals encoded in very low frequency (VLF) magnetic fields, which are less prone to attenuation by the surrounding environment than a typical cell or GPS signal. And the team has coupled that sensitive detection technology with a modulation scheme that can pack more information into the otherwise limited bandwidth of VLF fields. Anyone who’s struggled to get a decent cell signal in a building basement knows the penetration limits of the high-frequency RF bands used by mobile phones. But the problem goes much further than simple inconvenience. For example, high-frequency-signal attenuation prevents military submarines and underground surveying operations from taking advantage of GPS location, and can cause GPS to cut out in the dense, skyscraper-lined canyons of urban downtowns. And it can block wireless communication among first responders picking their way through debris or rubble-cluttered disaster scenes. Technically, those limitations relate to a quantity known as the skin depth—the depth in a material at which an AC electromagnetic field becomes attenuated to 1/e of its original strength. The skin depth is inversely proportional to the square root of the signal frequency (as well as the conductivity and relative permeability of the material the electromagnetic field is trying to penetrate). That means, for a given material, that the penetration depth for a signal in the gigahertz (GHz) band typical of modern wireless communications can be three orders of magnitude smaller than for a VLF channel in the kilohertz (kHz) range. An obvious way to address the skin-depth issue is to communicate at very low frequencies. But those frequencies have their own problems. The biggest is extremely limited bandwidth, which rules out data-intensive applications like position detection or video. Another problem is the large antennas required to pull in the faint VLF signals using conventional receiving equipment. As a result, while the VLF band is now used for communications with submarines underwater, the data exchange amounts to little more than text messages—and, to receive them, the sub must spool out a long antenna and rise to periscope depth. The NIST team, led by researcher Dave Howe, has proposed a solution to VLF’s sensitivity problems: Encode the modulated signal on low-frequency magnetic fields—and then reconfigure the new generation of ultrasensitive magnetometers that’s emerging from quantum technology as magnetic-radio receivers. This would push the receiver’s ability to pick up VLF communications far beyond that of conventional RF receivers. And, the team suggests, picking the right modulation scheme for encoding the signal could hammer down ambient noise, allowing the best possible use of the available bandwidth in these low-frequency chanels. The specific quantum sensor used by Howe’s team is an optically pumped magnetometer (OPM). These devices, typically employed to measure faint natural magnetic fields, are a bit more robust than alternatives such as superconducting quantum interference devices (SQUID), as OPMs can work at room temperature and have low size, power and cost requirements. The instrument used by the NIST scientists works by firing pump and probe lasers into a vapor cell containing isotopically pure 87Rb atoms. Changes in the quantum spin of the atom ensemble due to an external, signal-carrying modulated DC magnetic field result in changes in the probe light’s polarization as it passes through the ensemble. Those changes, in turn, are read out at a balanced polarimeter at the end of the chain, and converted into AC signals to decode the magnetic-radio signal. Meanwhile, on the transmission side, the team found that it could significantly reduce the impact of environmental noise—and, thus, boost the low-frequency signal’s carrying capacity—by adopting a digital binary phase-shift keying (BPSK) modulation scheme for the low-frequency magnetic-field signal. In particular, the BPSK modulation designed by the team had the effect of suppressing noise sources such as Earth’s natural magnetic background and the 50/60-Hz hum (plus harmonics) from the electrical power grid. In a proof of principle, the NIST researchers created a simple, single-channel digitally encoded DC magnetic signal, and found that the OPM setup could detect the faint, sub-kHz-frequency signal at picotesla field strengths, far below the ambient magnetic background noise, across a distance spanning tens of meters in the magnetically noisy indoor NIST setting. The team believes that range could be extended further, to the hundreds of meters, in less noisy environments, and through continued improvements both in sensor technology and signal modulation. Optics & Photonics News (OPN) is The Optical Society’s monthly news magazine. It provides in-depth coverage of recent developments in the field of optics and offers busy professionals the tools they need to succeed in the optics industry, as well as informative pieces on a variety of topics such as science and society, education, technology and business. OPN strives to make the various facets of this diverse field accessible to researchers, engineers, businesspeople and students. Contributors include scientists and journalists who specialize in the field of optics. We welcome your submissions. On a recent sunny afternoon, David Allen was standing by a third-floor window in a research building at the National Institute of Standards and Technology (NIST), holding in his hands a device that looked like a cross between a video camera and a telescope. The NIST campus is in suburban Gaithersburg, Maryland, but looking out the window, Allen could see 24 hectares (60 acres) of tulip tree, oak, hickory and red maple—a remnant of the northeastern hardwood forest that once dominated this landscape. Allen mounted the device on a tripod and pointed it out the window at the patch of forest below. The device wasn’t a camera, but a type of optical sensor that, if the science bears out, will be able to estimate the rate of photosynthesis—the chemical reaction that enables plants to convert water, carbon dioxide (CO2) and sunlight into food and fiber—from a distance. That measurement is possible because when plants are photosynthesizing, their leaves emit a very faint glow of infrared light. That glow is called Solar Induced Fluorescence, or SIF, and in recent years, optical sensors for measuring it have advanced dramatically. The sensor that Allen had just mounted on a tripod was one of them. Such a device would revolutionize agriculture, forestry and the study of Earth’s climate and ecosystems. NIST scientist David Allen and Boston University Ph.D. student Julia Marrs aim a SIF sensor at a specific tree in the NIST forest. Allen is a NIST chemist whose research involves remote sensing—the technology that’s used to observe Earth from outer space. Remote sensing allows scientists to track hurricanes, map terrain, monitor population growth and produce daily weather reports. The technology is so deeply embedded in our everyday lives that it’s easy to take for granted. But each type of remote sensing had to be developed from the ground up, and the SIF project at NIST shows how that’s done. Some satellites are already collecting SIF data, but standards are needed to ensure that those measurements can be properly interpreted. NIST has a long history of developing standards for satellite-based measurements, and Allen’s research is aimed at developing standards for measuring SIF. Doing that requires a better understanding of the biological processes that underlie SIF, and for that, Allen teamed up with outside scientists. At the same time that Allen was aiming a SIF sensor through that third-floor window, a team of biologists from Boston University and Bowdoin College was in the NIST forest measuring photosynthesis up close. A pair of them spent the day climbing into the canopy on an aluminum orchard ladder. Once there, they would use a portable gas exchange analyzer to measure photosynthesis directly based on how much CO2 the leaf pulled out of the air. They also measured SIF at close range. Other scientists checked on specially designed sap flow sensors they had installed on the trunks of trees to measure the movement of water toward the leaves for photosynthesis. “We’re measuring the vital signs of the trees,” said Lucy Hutyra, the Boston University ecologist who led the team of scientists on the ground. The idea was to use those ground measurements to make sense of the SIF data collected from a distance. “If we measure an increase in photosynthesis at the leaf, we should see a corresponding change in the optical signal,” Hutyra said. The research was also taking place at still a higher level. That afternoon, Bruce Cook and Larry Corp, scientists with NASA’s G-LiHT project, flew over the NIST forest in a twin-turboprop plane that carried multiple sensors, including a SIF sensor and Light Detection and Ranging (LiDAR) sensors that mapped the internal structure of the forest canopy. The aircraft made six parallel passes over the forest at about 340 meters (1,100 feet, slightly above the minimum safe altitude allowed by FAA regulations), the instruments peering out from a port cut into the belly of the aircraft. That gave the scientists three simultaneous measurements to work with: from the ground, from the window above the forest and from the air. They’ll spend months correlating the data. Currently, there is no reliable way to measure photosynthesis in real time over a wide area. Instead, scientists measure how green an area is to gauge how much chlorophyll is present—that’s the molecule that supports photosynthesis and gives leaves their color. But if a plant lacks water or nutrients, it may be green even if the photosynthetic machinery is switched off. SIF may be a much better indicator of active photosynthesis. When plants are photosynthesizing, most of the light energy absorbed by the chlorophyll molecule goes into growing the plant, but about two to five percent of that energy leaks away as SIF. The amount of leakage is not always proportional to photosynthesis, however. Environmental variables also come into play. The NIST forest is a test bed for understanding how all those variables interrelate. In addition to SIF data and the vital signs of trees, the scientists are collecting environmental data such as temperature, relative humidity and solar irradiance. They’re also figuring out the best ways to configure and calibrate the SIF instruments. Making SIF scalable is a key part of the measurement standard that Allen is working to create, and it will go from the ground level to measurements made from outer space. A corner of the NIST forest shot by NASA scientists, and the plane that carried them and their G-LiHT airborne imaging system. Using SIF to measure photosynthesis in real time would allow farmers to use only as much irrigation and fertilizer as their crops need, and only when they need it. Forest managers would be able to know how fast their timber is growing without having to tromp through the woods with a tape measure. Environmental managers would be able to monitor the recovery of damaged or deforested habitats after a drought or forest fire. And scientists would have a powerful new tool for studying how plants help regulate the amount of CO2 in the atmosphere. Humans add CO2 to the atmosphere when they burn fossil fuels, and land-based plants remove roughly a quarter of that CO2 through photosynthesis. But the environmental factors that affect that process are not well understood, mainly because scientists haven’t had a good way to measure the uptake of CO2 at the ecosystem level. SIF measurements, and the standards for interpreting them accurately, might help solve that problem. Studio photographers may be familiar with the 1,000-watt quartz halogen lamps known as “FELs.” Scientists use them too—specially calibrated ones, at least—to test the performance of light sensors that monitor Earth’s weather, plant life and oceans, often from space. A researcher at the National Institute of Standards and Technology (NIST) has recently made an improved mathematical model of the light output of FEL lamps. The new model, developed by NIST theorist Eric Shirley, will make the lamps more useful research tools, the scientists say, particularly for calibrating a relatively new class of cameras called hyperspectral imagers. Hyperspectral cameras are used for a wide range of monitoring applications, including biomedical, defense, and ground-based, air-based and space-based environmental sensing. While ordinary cameras only capture light in three bands of wavelengths—red, green and blue—hyperspectral imagers can be designed to see all the colors of the rainbow and beyond, including ultraviolet and infrared. Their increased range allows these cameras to reveal the distinctive signatures of processes that are invisible to the naked eye. Some of these effects are subtle, however—such as when researchers are trying to tease out changes in ocean color, or to monitor plant growth, which helps them predict crop productivity. “These are both examples where you’re looking at an extremely small signal of just a couple percent total,” said David Allen of NIST’s Physical Measurement Laboratory (PML). In cases like this, achieving low uncertainties in the calibration of their detectors is essential. Of particular interest to Allen and his colleagues was a calibration technique called the “lamp-plaque” method, popular with scientists because it is relatively inexpensive and portable. For this calibration procedure, researchers use a standard FEL lamp. Incidentally, FEL is the name designated by the American National Standards Institute (ANSI) for these lamps. It is not an acronym. First, the lamp light shines onto a white, rectangular board called a reflectance plaque, made of a material that scatters more than 99 percent of the visible, ultraviolet and near-infrared light that hits it. Then, after bouncing off the plaque, the scattered light hits the camera being calibrated. The method has been used for decades to calibrate other kinds of sensors, which only need to see one point of light. Hyperspectral imagers, on the other hand, can distinguish shapes. “They have some field of view, like a camera,” Allen said. “That means that to calibrate them, you need something that illuminates a larger area.” And the trouble with the otherwise convenient lamp-plaque system is that the light bouncing off the plaque isn’t uniform: It’s brightest in the center and less intense toward the edges. The researchers could easily calculate the intensity of the light in the brightest spot, but they didn’t know exactly how that light falls off in brightness toward the plaque’s edges. To lower the calibration uncertainties, researchers needed a better theoretical model of the lamp-plaque system. Shirley, the NIST theorist who took on this task, had to consider several parameters. One major contributor to the variations in intensity is the orientation of the lamp with respect to the plaque. FEL lamps have a filament that consists of a coiled coil—the shape that an old-fashioned telephone cord would make if wrapped around a finger. All that coiling means that light produced by one part of the filament can be physically blocked by other parts of the filament. Setting the lamp at an angle with respect to the plaque exacerbates this effect. To model the system, Shirley took into account the diameter of the wire and both coils, the amount of space between each curve of the coils and the distance between the lamp and the plaque. NIST scientists tested the actual output of some FEL lamp-plaque systems against what the model predicted and found good agreement. They say the uncertainties on light intensity across the entire plaque could now be as low as a fraction of a percent, down from about 10 to 15 percent. Moving forward, NIST will incorporate the new knowledge into its calibration service for hyperspectral imagers. But researchers are preparing to publish their results and hope scientists will use the new model when doing their own calibrations. The work could also serve as a foundation for creating better detector specifications, potentially useful for U.S. manufacturers who build and sell the cameras. An entirely new model of the way electrons are briefly trapped and released in tiny electronic devices suggests that a long-accepted, industry-wide view is just plain wrong about the way these captured electrons affect the behavior of hardware components such as flash memory cells. The model, devised by scientists at the National Institute of Standards and Technology (NIST), was tested to explain how electron capture and emission creates the insidious noise that increasingly threatens performance as electronic devices continue to shrink in size. Those effects, variously known as burst noise, popcorn noise or random telegraph noise (RTN) “have become a major problem for extremely small devices,” said NIST researcher Kin Cheung, the lead author of a new report in IEEE Transactions on Electron Devices . Charge trapping is one of the known causes of flash memory failure. The new model, which NIST physicist John Kramar called “a major paradigm shift in charge-trapping modeling,” could lead to a different approach to manage this problem, and potentially, a new way of making the memory cells smaller. RTN noise consists of abrupt random drops in voltage or current caused by itinerant electrons that are briefly captured from, and then rejoin, the main flow along a current channel in, for example, a common type of transistor called a MOSFET. “The effect was mostly negligible back in the good old days when devices were larger and there were lots of electrons flowing around,” Cheung said. But in today’s advanced devices, with feature dimensions in the range of 10 nanometers (nm, billionths of a meter) or less, the active area is so small that it can be swamped by a single trapped charge. In the case of RTN, the basics are known: The noise is caused by the action of electrons near the interface between two materials such as an insulator layer and the bulk of the semiconductor in a transistor. Specifically, an electron is pulled out of the current flow and trapped in a defect in the insulator; after a short time, it is emitted back into the main current in the semiconductor. What actually happens on the atomic scale at each stage of the process, however, is incompletely understood. The orthodox approach to account for those effects is to treat all the trapped electrons as a single 2-D sheet of charge that extends uniformly across the center of the insulator. Each emitted electron is thought to return to the semiconductor in a reverse of the same process by which it was captured, causing very little change in the presumably stable state along the insulator/semiconductor boundary. The researchers proposed a new model, based on local effects, in which the mechanisms of capture and emission are dramatically different from the standard picture. For one thing, they determined that quantum mechanics, the modern theory that describes the behavior of these systems, makes it hugely improbable, if not impossible, for electrons to get out of the insulator the same way they got in. The standard RTN picture supposes a weak interaction of trapped charge with its local surroundings―in this case, the highly separated electric charge in the silicon dioxide that often makes up the insulator layer in a transistor. NIST scientists found that a weak interaction is inconsistent with known physics and not in agreement with reports from two independent laboratories. Indeed, the interaction energy of a captured electron can be more than 10 times greater than previously believed. Recognition of this stronger interaction energy enables the new local field picture to explain RTN naturally. The success of the new model, and the resulting drastic change in the understanding of both capture and emission, suggested that many long-held ideas would have to be thoroughly reconsidered. The researchers hope the new model will help chip engineers and designers understand in much greater detail how devices degrade, and what will be required to get to the next stage of miniaturization while maintaining reliability and reducing noise. While quantum entanglement usually spreads through the atoms in an optical lattice via short-range interactions with the atoms’ immediate neighbors (left), new theoretical research shows that taking advantage of long-range dipolar interactions among the atoms could enable it to spread more quickly (right), a potential advantage for quantum computing and sensing applications. Physicists at the National Institute of Standards and Technology (NIST) have come up with a way to link a group of atoms’ quantum mechanical properties among themselves far more quickly than is currently possible, potentially providing a tool for highly precise sensing and quantum computer applications. NIST has applied for a patent on the method, which is detailed in a new paper in Physical Review Letters. The method, which has not yet been demonstrated experimentally, essentially would speed up the process of quantum entanglement in which the properties of multiple particles become interconnected with one other. Entanglement would propagate through a group of atoms in dramatically less time, allowing scientists to build an entangled system exponentially faster than is common today. Arrays of entangled atoms suspended in laser light beams, known as optical lattices, are one approach to creating the logic centers of prototype quantum computers, but an entangled state is difficult to maintain more than briefly. Applying the method to these arrays could give scientists precious time to do more with these arrays of atoms before entanglement is lost in a process known as decoherence. The method takes advantage of a physical relationship among the atoms called dipolar interaction, which allows atoms to influence each other over greater distances than previously possible. The research team’s Alexey Gorshkov compares it to sharing tennis balls among a group of people. While previous methods essentially allowed people to pass tennis balls only to a person standing next to them, the new approach would allow an individual to toss them to people across the room. Applying the technique would center around adjusting the timing of laser light pulses, turning the lasers on and off in particular patterns and rhythms to quick-change the suspended atoms into a coherent entangled system. The approach also could find application in sensors, which might exploit entanglement to achieve far greater sensitivity than classical systems can. While entanglement-enhanced quantum sensing is a young field, it might allow for high-resolution scanning of tiny objects, such as distinguishing slight temperature differences among parts of an individual living cell or performing magnetic imaging of its interior. Gorshkov said the method builds on two studies from the 1990s in which different NIST researchers considered the possibility of using a large number of tiny objects—such as a group of atom—as sensors. Atoms could measure the properties of a nearby magnetic field, for example, because the field would change their electrons’ energy levels. These earlier efforts showed that the uncertainty in these measurements would be advantageously lower if the atoms were all entangled, rather than merely a bunch of independent objects that happened to be near one another. Getting the atoms into an entangled state more quickly would be a potential advantage in any practical application, not least because entanglement can be fleeting. When a group of atoms is entangled, the quantum state of each one is bound up with the others so that the entire system possesses a single quantum state. This connection can exist even if the atoms are separated and completely isolated from one another (giving rise to Einstein’s famous description of it as “spooky action at a distance”), but entanglement is also quite a fragile condition. The difficulty of maintaining it among large numbers of atoms has slowed the development of entanglement-based technologies such as quantum computers. If the method can be experimentally demonstrated, it could give a quantum computer’s processor additional time so it can outpace decoherence, which threatens to make a computation fall apart before the qubits can finish their work. It would also reduce the uncertainty if used in sensing applications. Imagine a miniature device that suffuses each room in your house with a different hue of the rainbow—purple for the living room, perhaps, blue for the bedroom, green for the kitchen. A team led by scientists at the National Institute of Standards and Technology (NIST) has, for the first time, developed nanoscale devices that divide incident white light into its component colors based on the direction of illumination, or directs these colors to a predetermined set of output angles. Viewed from afar, the device, referred to as a directional color filter, resembles a diffraction grating, a flat metal surface containing parallel grooves or slits that split light into different colors. However, unlike a grating, the nanometer-scale grooves etched into the opaque metal film are not periodic—not equally spaced. They are either a set of grooved lines or concentric circles that vary in spacing, much smaller than the wavelength of visible light. These properties shrink the size of the filter and allow it to perform many more functions than a grating can. For instance, the device’s nonuniform, or aperiodic, grid can be tailored to send a particular wavelength of light to any desired location. The filter has several promising applications, including generating closely spaced red, green and blue color pixels for displays, harvesting solar energy, sensing the direction of incoming light and measuring the thickness of ultrathin coatings placed atop the filter. In addition to selectively filtering incoming white light based on the location of the source, the filter can also operate in a second way. By measuring the spectrum of colors passing through a filter custom-designed to deflect specific wavelengths of light at specific angles, researchers can pinpoint the location of an unknown source of light striking the device. This could be critical to determine if that source, for instance, is a laser aimed at an aircraft. Matthew Davis and Wenqi Zhu of NIST and the University of Maryland, along with Agrawal and NIST physicist Henri Lezec, described their work in the latest edition of Nature Communications. The work was performed in collaboration with Syracuse University and Nanjing University in China. The operation of the directional color filter relies on the interaction between the incoming particles of light—photons—and the sea of electrons that floats along the surface of a metal. Photons striking the metal surface create ripples in this electron sea, generating a special type of light wave—plasmons—that has a much smaller wavelength than the original light source. The work described in the new paper was conducted at NIST’s Center for Nanoscale Science and Technology.